The variability of supplier responses to bid events can pose significant financial and operational risks to energy companies, especially as this behavior is prone to change when market and economic conditions shift. Variances in bid responses during the recent economic recession and recovery motivated PowerAdvocate to analyze the impact of macroeconomic factors on supplier bidding behavior. The aim of this analysis was to uncover trends that, when coupled with project and company-specific data, will enable industry leaders to better anticipate and mitigate project and supplier risk. If you missed our introduction of this analysis, you can read our previous blog about it here. Our team hypothesized that suppliers who offer a diverse range of services, work across multiple industries, and service a wide geographic area respond to macroeconomic circumstances differently than smaller or more specialized suppliers. To measure these differences, and to better understand how a supplier’s profile influences their behavior, the team categorized bid data into two groups: bids from major suppliers and bids from specialized suppliers. Historically, energy firms have seen uncertainty in their supplier’s behavior as simultaneously unmanageable and a source of severe risk for their operations. This uncertainty can cause major projects to fall behind schedule and can create reputational and financial loss for an organization. While this risk has always been a concern for energy firms with high exposure to contractors, the volatility of today’s market highlights the need for all companies to be able to proactively mitigate the risk that suppliers pose to major projects and operations. 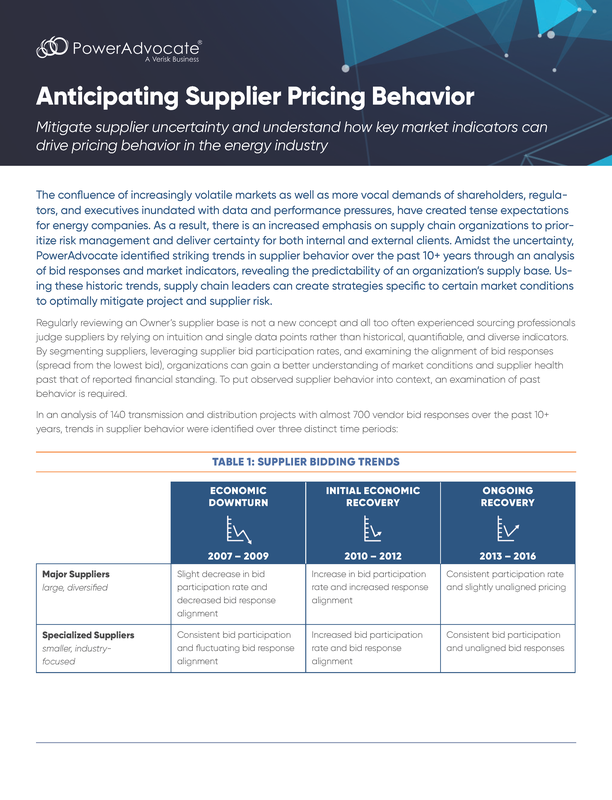 Leveraging PowerAdvocate’s energy supplier database of $3.3T in energy market spend and 70K sourcing events, we identified and quantified trends in supplier bidding behavior. Using these insights, energy firms can efficiently plan for changes in bidding behavior and mitigate risks during market fluctuations. UPDATE: In a surprising move, President Trump announced on March 1 that he intends to impose sweeping 25% tariffs on steel imports and 10% tariffs on aluminum -- the most severe of the potential trade remedies recommended by the Department of Commerce. Details of the plan are still unknown, but the announcement has already driven dramatic steel and aluminum price increases and spooked equipment manufacturers. Register for our March 13 webinar for the latest updates on Section 232. Read on for our initial analysis of the Department of Commerce's recommendations. More likely than not, your utility is already or soon will be procuring battery energy storage as part of its grid modernization strategy. In fact, according to BCC Research, the global market for grid-scale battery storage technologies is projected to reach nearly $4.0 billion in 2025, up from $716 million in 2015. Battery costs have fallen dramatically over the past decade. However, events in the Democratic Republic of the Congo are putting the brakes on further cost reductions. Here’s a look at what’s happening and how you can approach your battery procurement planning in light of these events. As the Texas and Louisiana Gulf Coast recovers from Hurricane Harvey, Supply Chain organizations face the challenge of navigating its effects, from chemicals to logistics to labor. Do you manage a utility supply chain, procurement process, or supplier relationships? Or collaborate with and depend on teams that do? If so you know how heavy a lift it can be to effectively manage asset-intensive energy sector costs. Should-cost analysis helps address two key challenges that get in the way of delivering even more value for your organization. The Chief Procurement Officer’s organization has become a central driver of utility competitiveness and operational efficiency. During the EEI Annual Conference 2017 in Boston earlier this month, we had a number of discussions with CFOs around how Finance and Supply Chain can collaborate more closely to drive enterprise-wide value and efficiencies. Here's what we're seeing. Making any change to an organization requires proactive management to ensure a smooth transition. There are many potential pitfalls that can arise if all affected stakeholders are not aligned and actively engaged in the process.